Having the right or wrong tire width when cornering can be the difference between speeding into and through a corner successfully and having to slow down or wiping out because of the wrong width. So I have done some research on this. What is the best width for mountain bike tires for good cornering? A mountain bike tire width of 2.5 to 2.6 inches is best for cornering. This tire width should be matched with 30 to 35mm rims. This combination will give you the most traction for cornering without losing speed. 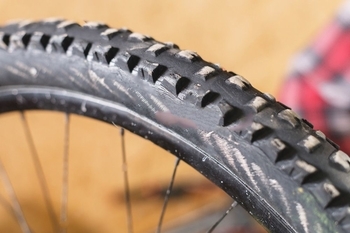 2.5 to 2.6 inch mountain bike tires are known as wide trail tires. This width is sort of the sweet spot for mountain bikers who do a lot of cornering. It combines speed and traction. If the tires are narrower then you will lose traction. If the tires are wider then you will lose speed. You also need to have the right rim width which is 30 to 35mm wide. If the rim is too wide then the profile will be too square. The knobs will be too vertical on the side instead of rounded when you lean the bike for a corner. You won’t have enough grip. When you lean your bike the knobs should lean at a 45 degree angle ensuring the most traction while also being able to maintain a high speed. With a square profile you no longer have any knobs on the edge of the tire to lean into to gain traction. This will cause sliding and a wipe out. If the rim is too narrow then the width of the tire becomes too tall and round like a balloon. It becomes too flexible at the top because the casing is constricted. This will cause the tire to shift and cause unstable cornering. A 2.4 inch tire won’t have as much traction, but will give you a very accurate feel. Riders will remain more upright when leaning inward during cornering. You will have a consistent feel when hard cornering. A 2.8 inch tire will give you more traction and soak up the trail. You will ride more confidently but have less sidewall stiffness. Hard cornering in berms will feel sluggish for aggressive riders, especially when you exit the corner. The Maxxis Minion DHR II is a wide trail tire specifically designed to have better grip for cornering. In order for it to have a good round tire profile the casing is wider so it can be used on a rim that is at least 30mm wide to 35mm. This tire has a good channel on the tread that locks you right into the turn. The knobs on the tire are spaced far enough apart from each other to give you very strong traction for cornering. The tire is constructed with 3C Maxx Terra Rubber Compound. The base layer of the compound is a hard compound and runs through the tread. The top layer is a medium compound and run in the center of the tread. The shoulder layer is a soft compound which runs only on the left side and right side tread. This soft compound increases the grip for cornering. This tire has a width of 2.5 inches and is compatible with a 27.5 in wheel mountain bike. The conditions it is capable of riding on are loose, loose over hard, medium, and wet. The tires are best suited for enduro and all-mountain. It is tubeless ready, and comes in threads per inch from 60 to 120. A higher TPI gives you better ride quality and is heavier in weight. The various weights of the tire you can choose from are 945g, 980g, and 1170 grams. If you want to get the most out of cornering with 2.5 width tires then you need to use the right tire pressure or psi. The best way to start would be to use the recommended psi that you see on the side wall of the tire. Then if you want to have more grip for cornering you can lower the psi one or two psi. If you want a bit more speed on the trails then you can increase the psi 1 or 2 psi. You will know you have it right when your tires feel stable during cornering, braking, and accelerating. Also, depending on where you want more grip you can make the psi uneven between the front and back tire. Many riders run a higher psi on the back tire for speed and a lower psi on the front tire for grip. This helps you have more grip going into a corner and more speed exiting a corner. By riding on tires that have the right width for the most traction you can maximize the grip even more by managing your body weight distribution as you ride. There are two ways of doing this. The first way is to transfer your weight so it is entirely on one pedal. This will help the side tread of the tire to really dig into the trail and increase the grip. Next you can use your elbows and legs to push your weight down into the front wheel or the back wheel at the proper time you want the most traction from each tire. Practice leaning your bike to the left and then to the right quickly. Be sure to get your hips out to the left when leaning left, and right when leaning right. This will push your weight down and into the treads of the tires. As you go into a corner push your weight into your tires. This will increase your grip and you will turn more quickly. This is known as pumping. Keep your head and core as still as possible by using the bend in your elbows and knees to act as shock absorbers. Keep your chest as low as you can as you give a strong push through the bars, your front wheel will become lighter. Then you will be heavy on your back tire, which will dig into the ground with traction. When you are going through a corner, if you start to slide out, then start to pedal. This will help to push your back wheel into the ground and exit the corner smoothly and quickly. In order to increase the weight on the front wheel while in a corner, put your inner foot out and forward. This will help your front wheel from sliding out as you move your weight forward and add more pressure to it. If you need to, do your braking before you get to the corner. If you brake while in the corner your tires will lose grip. If you are going to brake while in a corner then feather your braking by using one finger braking. Try practicing braking before getting to the corner and see if you can if can get you technique right so you feel the increase in grip and you go around the corner and exit quickly. The key to nailing a corner is to use pressure control to load the mountain bike into a corner by pumping and turning together. This should be done smoothly so it feels flowy and you are leaning left and right, taking full advantage of your wide tires grip using your weight to add the right amount of pressure.